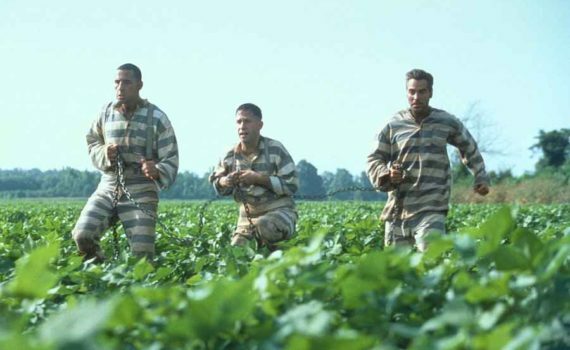 Movie Review – O Brother, Where Art Thou? Does it get any better over a four-year span than Fargo, Big Lebowski, and O Brother? The Coen Brothers are known as geniuses for their writing, directing, producing, and general creating of instant American classics, with films ranging from No Country for Old Men to Inside Llewyn Davis, but from 1996 to 2000 they were virtually perfect. Fargo is bloody & hilarious, Big Lebowski is out of this world, and O Brother is a musical masterpiece. I’m both proud to say that my last name is also Coen and happy to call this duo one of my top favorite filmmakers, two voices that deserve to be heard. I still enjoy their new films, look forward to anything they have coming out, but these three icons will always remain their best work to me, and getting a chance to rewatch any of these favorites is always a real treat. In O Brother, we travel back in time to the deep South of the 1930s, where rural tradition was meeting progress, where the old way of living was being left behind, and where sometimes crime was the only way to survive. Three members of a local prison farm chain gang escape together into the backwoods, seeking a buried treasure that’s soon to be washed away by the flooding of a valley. Everett is the leader, an intelligent con man of sorts who can’t seem to make an honest living. Pete is his sometimes contentious companion, coming along because he had very little choice. And Delmar is their dimwitted friend, an amiable man who just wants to help. Together, the trio go on an adventure all over the great state of Mississippi, facing the police, crooked politicians, bible salesmen, bank robbers, ex-wives, and the Lord Almighty, on a quest to find their fortunes & themselves. It’s not a secret or a revelation that O Brother is based loosely on The Odyssey, Everett once even introducing himself as Ulysses. We get the long trek home, the cyclops, the sirens, the suitors for Penny, the whole bit. It’s an extremely clever adaptation, taking a story we all know, turning it on its head, and delivering it to us with a unique blend of humor & heart that’s worth watching over and over again. The characters are incredible, tossing out quotable line after quotable line like they were completely free. The cinematography is a spectacle, each scene a perfect still image, the music is incredible, a bluegrass concert right in our living rooms, and the acting it top-notch, with wonderful side actors like John Goodman and Holly Hunter. O Brother is infectious really, a strange film that you won’t be able to stop yourself from loving. It’s original, heartfelt, warm, catchy, funny, goofy, and made with an undeniable attention to detail, a movie that you won’t soon forget.